If you're looking for the best wedding photographer in Estes Park then look no further than Mark Creery Photography. I excel at capturing the scenery that makes Estes Park an amazing place for your wedding while still showcasing your personalities and love story. I have worked at many of the best wedding venues in town, as well as explored the multitude of scenic locations around. There are so many options in the area that every photo taken here is unique. The rocky peaks and features, lush evergreens and aspens, gorgeous Fall colors, and interesting wildlife abound. I have captured lots of elk in the background of photos - at a safe distance of course! If you're up for a hike to get somewhere I am up for it too! In this portrait taken at Lily Lake in Rocky Mountain National Park, on the outskirts of town, I captured a quiet intimate moment between the bride and groom. 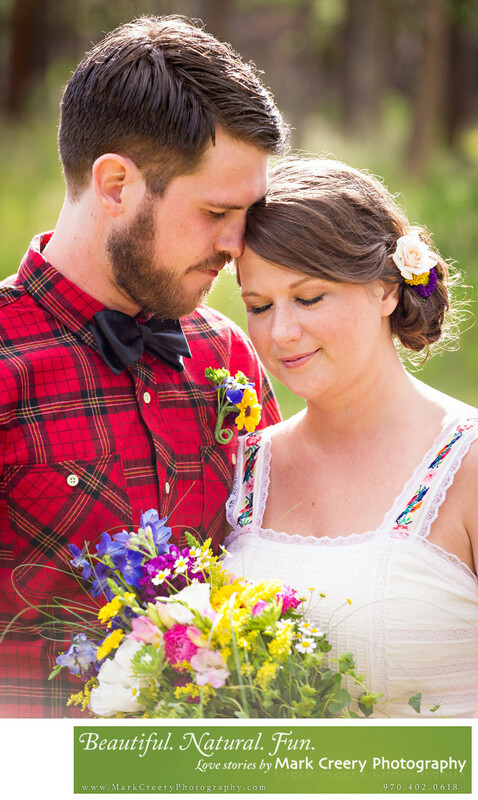 The groom has a red flannel shirt and the bride was wearing a boho dress that matched their low-key wedding style, with her wildlife bouquet accentuating the color palette. We walked around the lake to capture a wide variety of scenic and close-up portraits like this one.